This cookbook provides you with hundreds of practical examples for using CSS to format your web pages, complete with code recipes you can use in your projects right away. 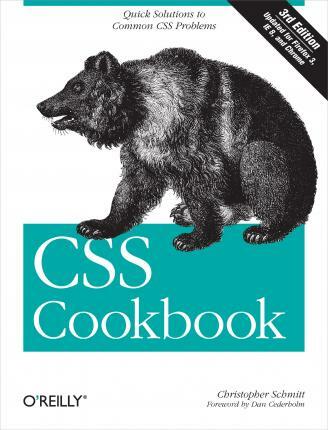 With "CSS Cookbook", you'll go beyond theory to solve real problems, from determining which aspects of CSS meet the specific needs of your site to methods for resolving differences in the way browsers display it. Arranged in a quick-lookup format for easy reference, the third edition has been updated to explain the unique behavior of the latest browsers: Google Chrome, Apple Safari, Microsoft's IE 8, and Mozilla's Firefox 3. With topics that range from CSS basics to complex hacks and workarounds, this book is a must-have companion, regardless of your CSS experience. Each recipe includes an explanation of how to customize the formatting for your needs, and each chapter features a sample design of the topics discussed. Learn the basics, such as understanding CSS rule structure. Work with web typography and page layout. Create effects for images and page elements. Learn techniques for formatting lists, forms, and tables. Design effective web navigation and create custom links. Christopher Schmitt is the founder of Heat Vision, a small new media publishing and design firm, based in Cincinnati, OH. An award-winning web designer who has been working with the Web since 1993, Christopher interned for both David Siegel and Lynda Weinman in the mid 90's while he was an undergraduate at Florida State University working on a Fine Arts degree with an emphasis on Graphic Design. Afterwards, he earned a Masters in Communication for Interactive and New Communication Technologies while obtaining a graduate certificate in Project Management from FSU's College of Communication. He is the author of CSS Cookbook, which was named Best Web Design Book of 2006, and one of the first books that looked at CSS-enabled designs, Designing CSS Web Pages (New Riders). He is also the co-author of Adapting to Web Standards (New Riders), Professional CSS (Wrox), Photoshop in 10 Steps or Less (Wiley) and Dreamweaver Design Projects (glasshaus) and contributed four chapters to XML, HTML, and XHTML Magic (New Riders). Christopher has also written for New Architect Magazine, A List Apart, Digital Web and Web Reference. He is the list moderator for Babble, a mailing list community devoted to advanced web design and development topics. With the Web Standards Project, Christopher helps co-lead the Adobe Task Force while contributing to its Education Task Force. On his personal web site, Christopher shows his true colors and most recent activities. He is 6'7" and doesn't play professional basketball but wouldn't mind a good game of chess.